← Islamo-Nazis and Communists DO NOT belong in AMERICA! 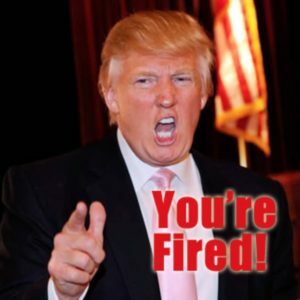 Trump to Democrat acting Attorney General – YOU’RE FIRED! While waiting for Sen. Jeff Sessions to be confirmed to the Trump Cabinet as Attorney General, an Obama appointed interim Democrat is holding the place vacated by AG Loretta Lynch. Trump just fired her for refuses to abide by the president’s immigration order to investigate anyone travelling to terrorist nations. As Democrats deliberately obstruct President Trump’s Cabinet appointments, they are operatives still in the administration working to sabotage the will of the people. President Trump, true to his word, wasted no time in taking rightful action and fired her on Twitter! This is all the proof necessary that Republicans should be using the Democrat’s nuclear action on the perpetrators of obstructionism that must not be permitted to stop Trump from beginning the repair of America. Leftists are saying Trump voters didn’t want the president to actually do what he campaigned on doing. This is as liberals backwards thinking as it gets! It is the thinking of people who are used to lawyer politicians making campaign promises and keeping none of them. These are Obama people who loved hearing Obama say he would make healthcare more affordable for all, but complained not when costs doubled. Just as they cry foul and shed tears over a few people being inconvenienced in airports while their travel background to terrorist nations is assessed, but they say nothing about Islamic jihadis murdering hundreds of Americans. Why do leftist liberal Democrats want to invite Islam into America? Why do they rally to their defense whenever one of them wages Jihad and kills Americans? Why do they advocate for establishing Sharia law over the Constitution, the law that allows honor killings, female genital mutilation, and exterminating homosexuals? Leftists are either deeply confused or deliberately subverting America. Their actions make it very obvious that half of them are deeply confused because they believe the other half is duping them. It is time we light them up and show them to the world for what they are. This entry was posted in Illegal Immigration, Islamism, Politics and tagged Democrats advocate for Jihad, Democrats obstruct Trump's Cabinet, Donald Trump, Illegal Immigrants, Immigrating terrorists, Islam, Islamists, Jihad, Terrorist immigrants, Trump fires acting Attorney General, Trump immigration order. Bookmark the permalink. 2 Responses to Trump to Democrat acting Attorney General – YOU’RE FIRED! I don’t particularly care for the use of EO; I had high hopes for McConnell that he would take the lead in approving the President’s cabinet picks. I was wrong and McConnell has given Trump no choice but to use EO to further his agenda.